Emblem of Liwa Sayf al-Haq Assad Allah al-Ghalib. With a balance flanked by two Syrian flags, the bottom of the emblem features the legendary Dhu al-Fiqar sword of Imam Ali, with the inscription: "There is no hero but Ali and no sword but the Dhu al-Fiqar." The Sayyida Zainab area in Damascus- home to the Sayyida Zainab shrine- serves as a primary base for many Shi'i militias, including a number of Iraqi formations like Liwa al-Imam al-Hussein, Liwa Dhu al-Fiqar and the Rapid Intervention Regiment. The Sayyida Zainab area is also the main base for the Syrian Shi'i militia Liwa Sayf al-Mahdi, which is affiliated with the 4th Armoured Division and has primarily served to maintain checkpoints. Somewhat similar in nature to Liwa Sayf al-Mahdi is Liwa Sayf al-Haq Assad Allah al-Ghalib ("The Sword of Truth Brigade: The Conquering Lion of God"). The latter part of the group's name is a reference to Imam Ali. The imagery is reinforced by the inclusion of the Dhu al-Fiqar in the emblem. Like Liwa Sayf al-Mahdi, Liwa Sayf al-Haq Assad Allah al-Ghalib is a Syrian militia with its base in the Sayyida Zainab area. However, its affiliation is not with the 4th Armoured Division, but rather the elite Republican Guard. This point is corroborated in open source data and the testimony of one Abu al-Layl al-Sadri, a fighter with Liwa Dhu al-Fiqar who resides opposite the militia's base. According to Abu al-Layl al-Sadri, Liwa Sayf al-Haq Assad Allah al-Ghalib's base is located in the vicinity of theMudhafa Fatimiya ('Guest-House of Fatima') in the Sayyida Zainab area. For context, the Mudhafa Fatimiya has also served as a conference venue, featuring one in November 2014 on the rebellion of Imam Hussein organized by Ayatollah Khamenei's office in Syria and attended by the Social Committees Commission in the Sayyida Zainab area. More recently, the venue hosted a solidarity event with Hezbollah in March 2016 following its designation as a terrorist organization by Gulf Arab states. The event was notably attended by pro-regime Palestinian factions and militias, such as the PFLP General Command. 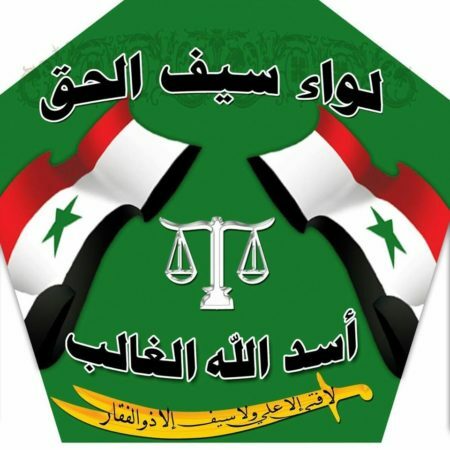 Though the group's emblem suggests that Liwa Sayf al-Haq Assad Allah al-Ghalib is a Shi'i militia, Abu al-Layl al-Sadri noted that this impression is not quite the case. Whereas Liwa Sayf al-Mahdi is described as a militia composed of Syrian Shi'a, he clarified that the members of Liwa Sayf al-Haq Assad Allah al-Ghalib "show affection- you can say- and believe in the traditions of the Shi'a, following and participating in the occasions." This may reflect a trend whereby some pro-regime factions, on account of the important role played by Iran and foreign Shi'i militias in supporting the regime, display affinities with Shi'i Islam even if there is no outright conversion, which has taken place in the case of Liwa al-Baqir, a militia of Shi'ified Bekara tribesmen in Aleppo. The trend of affinity with Shi'i Islam can be influenced by recruitment of Syrians into the ranks of the foreign militias and close cooperation between those militias and the native formations. For example, a video uploaded by Liwa Salah al-Din al-Ayyubi, one of the components of the Dir' al-Watan ('Homeland Shield') collection of Syrian militias led by Hayder al-Juburi (leader of the Iraqi Shi'i militia Liwa Dhu al-Fiqar), features the song 'Ya Zainab' by the Iraqi Shi'i munshid Ali al-Mawali. 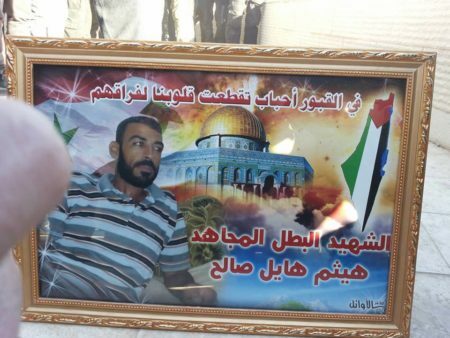 In a similar vein, Muhammad Suleiman Harura, a declared 'martyr' for the Palestinian militia Liwa al-Jalil (which seems to be inactive at the present time), posed with insignia and banners of 'Labbayk ya Zainab' ('At your service, oh Zainab'). Yet another example of Zainab sloganeering can be found in the militia Fawj Abu al-Harith 313 (also known as Saraya al-Areen), which appears to be based in Latakia and has fought on that front in addition to Aleppo. Abu al-Layl al-Sadri added that the group's formation dates back to two years ago. Under the leadership of one Ghalib Abu Ahmad (whose son Ahmad is actively involved in fighting, distinguishing himself in the Qalamoun mountains), Liwa Sayf al-Haq Assad Allah al-Ghalib's main engagements to date appears to have been in Damascus and the wider countryside area. For example, in January 2015, the group posted photos of its fighters in the snow-covered Qalamoun mountains. 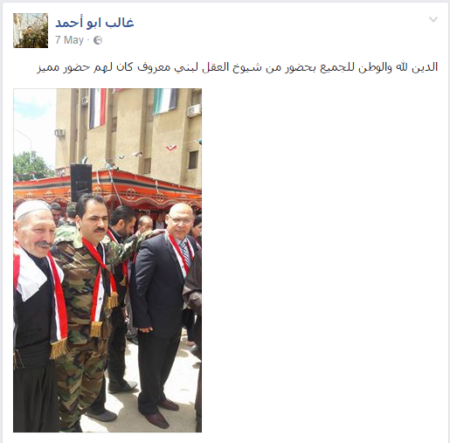 In March 2015, the group posted a photo of a group of its fighters near the locality of Falita in Qalamoun. In May-June 2015, the group claimed participation alongside Hezbollah and the Republican Guard in fighting against rebels in the Jaroud al-Qalamoun area. Later in the year, the group claimed to be fighting on the periphery of Dahiyat al-Assad and the Harasta area to the northeast of Damascus alongside the Syrian army, in addition to maintaining frontline positions in the Qalamoun mountains and participation in efforts to reopen the Harasta highway. In the fighting on the periphery of Dahiyat al-Assad, the group claimed at least three 'martyrs'. During the Harasta operations, a 'martyr' was claimed for Liwa Sayf al-Haq Assad Allah al-Ghalib in one Haitham Hayel Saleh. Originally said to have been from the Palestinian refugee camp of Sabina in Damascus, he was buried in the Martyrs cemetery in the Sayyida Zainab area. 'Martyrdom' portrait for Haitham Hayel Saleh. Note the inclusion of the Dome of the Rock in Jerusalem and the Palestine flag covering the entirety of what is the Israel-Palestine area today. Most recently this month, Liwa Sayf al-Haq Assad Allah al-Ghalib's leader announced the loss of a field commander by the name of Nour Abdullah Muhammad, said to have been killed fighting on the East Ghouta front. 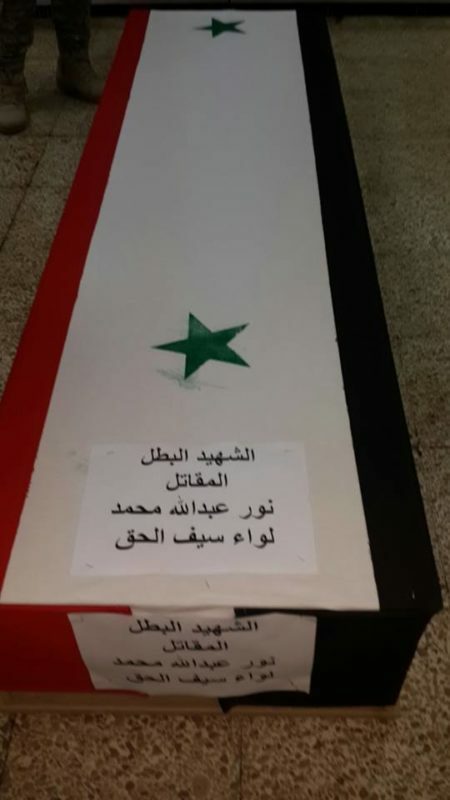 Coffin for Nour Abdullah Muhammad. Note the 'Liwa Sayf al-Haq' inscription. 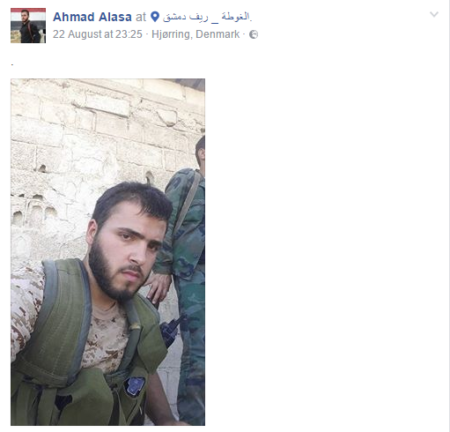 Ghalib Abu Ahmad's son advertising his presence as being in the Ghouta area, late August 2016. Social media content for Liwa Sayf al-Haq Assad Allah al-Ghalib also points to social outreach activities. For example, the militia's leader has participated in events to commemorate 'martyrs', including the annual occasion of Martyrs Day in May. Ghalib Abu Ahmad (centre) at Martyrs Day commemoration: "Religion is for God and the homeland is for all [a saying attributed to Sultan Pasha al-Atrash, the Druze leader of the Great Syrian Revolt in the 1920s], in the presence of the sheikhs al-'aql of the Bani Ma'arouf [Druze]: they had a distinguished presence." Liwa Sayf al-Haq Assad Allah al-Ghalib, like Liwa Sayf al-Mahdi, presents an interesting case of a militia with a religious image attached to an elite Syrian army division: an image no doubt influenced by the presence of the group's base in the Sayyida Zainab, the main hub of Shi'i militancy in Syria. This phenomenon undoubtedly contributes to sectarian perceptions of the Syrian civil war along the Sunni-Shi'i line.